Yesterday was the worst day of the year for me . . . The day where I intended to ice-fish but finally decided I better stay off. Actually I believe we could have safely fished, of course I had to hunt for a place to get on the ice, and there was 8-10 inches of ice, but the top half of that was honey-combed. I actually walked all the way out to an area I would have liked to fish, wearing a life-jacket of course, and I never broke through, never even got my boots wet, but we just were not comfortable with it. Now I have to wait until next winter. Grrrrrrrr. And this morning it is snowing like crazy here in Lincoln. I am just warning you, if you have been walking around talking about how you cannot wait for open-water, you better not mention that to me this morning. You might get kicked. How much open-water can you fish today?????? And if you could, how many fish could you catch with these weather conditions? Nope, give me ice, give it to me as long as possible. Sorry, had to get that off of my chest. I only feel a little better; will take a nice fish or two on the end of my line to completely change my attitude. 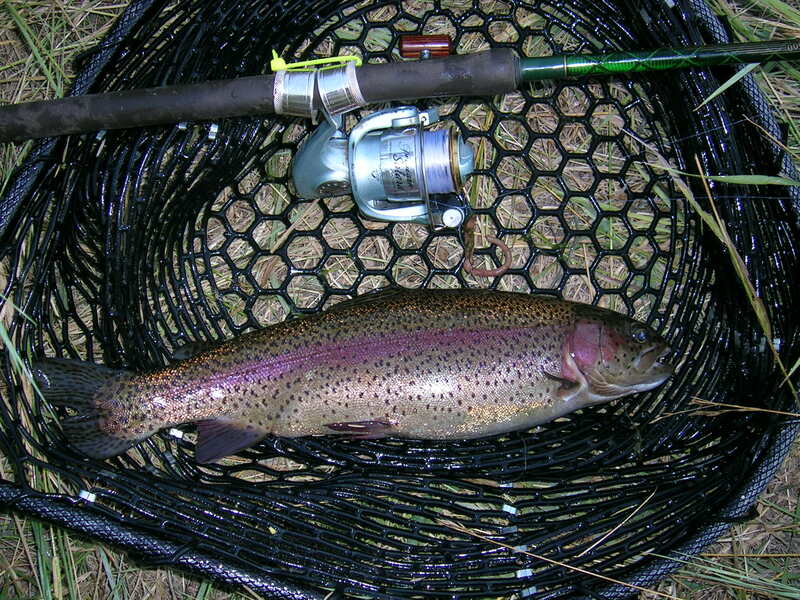 Stay tuned for the stockings of catchable-size rainbows around the state this spring. Obviously those stockings are dependent on water and weather conditions and we have been “on hold” waiting for ice to melt. However, I can tell you that we are “GO” for the Trout Lake at Two Rivers State Recreation Area ( http://www.ngpc.state.ne.us/parks/guides/parksearch/showpark.asp?Area_No=175 ) to open Saturday, March 13, the day after tomorrow. We have stocked 7400, 10-inch rainbows there this week. If you plan to take advantage of that, keep a couple of things in mind: First, you have to stop at the office and purchase a trout tag to fish for trout on the Trout Lake. The trout tag costs $4 and allows the harvest of 4 trout (by the way, each one of those trout is probably worth at least $1.50). A person can purchase up to 3 tags per day which would allow the harvest of up to 12 trout. An adult angler can have up to two children under the age of 16 fish on their tag, but each tag only allows the harvest of 4 trout. Only one pole is allowed per angler on the Trout Lake. Secondly, there likely will be some ice still on the Trout Lake; stay off of it. There is some open water there and that is the water you will have to fish. Oh man, I can’t wait for open water! How bout you Daryl??? ?